#1. This week's number one is an experienced former international power forward Babacar Toure (205-85, currently plays in Basketball Champions League). He led his Swiss team Fribourg to an overtime victory over the 19th-ranked Groningen (1-3) 79-77 in the Basketball Champions League in Friday night's game. Toure was MVP of the game. He had a double-double by scoring 18 points and getting 11 rebounds. Toure also added 3 assists in 37 minutes on the court. Fribourg Olympic (5-0) is placed first in the Basketball Champions League. So far his team won all five games in the Qualifying Round. The Qualifying Round already ended in the Basketball Champions League. Toure has individually a very good year with high stats. He averages: 15.7ppg, 10.5rpg, 3.5apg, 2FGP: 64.3%(36-56), 3FGP: 11.1% and FT: 86.4% in six games he played so far. Toure played for the Senegalese senior national team four years ago. #2. 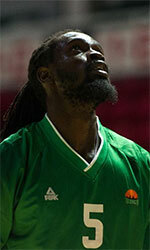 Second place goes to former international center Moussa Diagne (211-94, currently plays in EuroCup). Diagne could not help Andorra (0-1) to beat Galatasaray (1-0). He was the second best scorer with 9 points. Diagne also added 7 rebounds. It was his first game for Andorra this season. 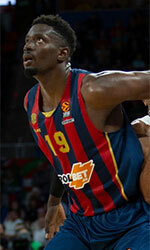 But the sixth-placed Andorra (0-1) was defeated 84-73 on the road by the leading Galatasaray in the group A of Eurocup. But this is still an early stage of the season and everything may happen. Diagne has a dual citizenship: Senegalese and Spanish. Worth to mention he played also at Eurobasket Summer League, which helped him get the job in pro basketball. He played for the Senegalese national team in 2016. #3. The Senegalese player who performed third best last week abroad was an international forward Maurice Ndour (206-92, college: Ohio, currently plays in EuroCup). Ndour led his Russian team Unics Kazan to a victory over the fourth-ranked Mornar Bar (0-1) crushing them 97-74 in the Eurocup in Wednesday night's game. He was the best player in that game. Ndour recorded 29 points (!!!) and grabbed 8 rebounds (made all of his seven free throws). It was his first game for Unics Kazan this season. His team is placed second in group D. But the season is still in it's first stage and everything can happen. Ndour is also a member of the Senegalese senior national team. #4. Center Youssou Ndoye (213-91, college: St.Bonaventure, currently plays in France) contributed to a JL Bourg's victory against the 11th-ranked Chalon/Saor (2-1) 93-84 in the French ProA last Monday. He scored 13 points and grabbed 7 rebounds in 31 minutes. JL Bourg Basket (2-1) is placed fourth in the ProA. But there are still lots of games to play and it's a long way to go. Ndoye has relatively good stats this year: 13.3ppg, 9.3rpg, 1.3apg and 1.3bpg in three games. He is also Senegalese national team player. #5. International center Cheikh Mbodj (208-87, agency: Octagon Europe, college: Cincinnati, currently plays in Basketball Champions League) was not able to help Twarde Pierniki (2-3) in their last game. Despite his good performance Twarde Pierniki was edged 73-73 in Bayreuth by the lower-ranked (#13) BBC Bayreuth. Mbodj scored 14 points, 4 rebounds and made 2 blocks in 23 minutes. The Qualifying Round already ended in the Basketball Champions League. This year Mbodj has relatively solid stats: 11.0ppg, 5.0rpg and 1.8spg in six games. He plays currently for the Senegalese national team. #6. Forward Mouhammad Faye (207-85, college: SMU, currently plays in ABA League) was the major contributor in a Crvena Zvezda's victory against the eighth-ranked Cibona (0-1) 78-68 in the ABA League last Friday. Faye recorded 12 points, 6 rebounds and 3 blocks. It was his first game for Crvena Zvezda this season. His team is placed third in the ABA League. Faye is an international player who is currently on the senior Senegalese National Team roster. #7. Former international center Bamba Fall (217-86, college: SMU, currently plays in Latvia) was not able to secure a victory for TLU/Kalev (1-1) in their game against VEF Riga (2-0) in the Latvian LatEstBL, despite his very good performance on Sunday night. He had a double-double by scoring 16 points and getting 10 rebounds. Fall also added 3 blocks in 32 minutes. But TLU/Kalev was crushed 95-56 in Riga by the second-ranked VEF Riga. His team will play only one more game in the Regular Season. And that game will be critical. Fall has reliable stats this year: 14.5ppg, 9.5rpg and 1.5bpg in two games. He used to play for the Senegalese national team eleven years ago. #8. Point guard Clevin Hannah (179-87, agency: BeoBasket, college: Wichita St., currently plays in Spain) couldn't help Gran Canaria in their game against Blusens Monbus (2-0) in the Spanish Liga Endesa. Despite his very good performance in Thursday night's game Hannah recorded a double-double by scoring 13 points and making 10 passes. He also added 5 rebounds. It's Hannah's first season with the team. Hannah's stats this year are: 12.5ppg, 3.5rpg and 5.5apg. He is another player who holds two passports: Senegalese and American. Hannah used to play for the Senegalese national team last year. #9. International center Hamady N'Diaye (213-87, college: Rutgers, currently plays in Italy) managed to help Sidigas Avellino to win against the league outsider MIA-RO Cantu (0-1) 98-81 in the Italian Serie A on Saturday night. He recorded only 4 points, 4 rebounds and 5 blocks. Sidigas Avellinois placed in the Serie A. N'Diaye's stats this season are: 12.5ppg, 3.5rpg and 5.5apg. He is also in the roster of the Senegalese national team. #10. Power forward Jules Aw (202-86, currently plays in Switzerland) couldn't help Massagno in their game against Lakers (1-0) in the Swiss SBL. Despite his very good performance in Saturday night's game Aw recorded a double-double by scoring 21 points and getting 16 rebounds. It was his first game for Massagno this season. Aw is a former international player as eleven years ago he still played for the Senegalese senior national team. #11. U18 international center Amar Sylla (206-1, currently plays in Spain) helped Real Madrid II win their game against the 16th-ranked Zentro Basket 92-82 in a derby game in the Spanish EBA (fourth division) on Saturday night. Sylla had a double-double by scoring 13 points and getting 12 rebounds in 28 minutes. This year Sylla's overall stats are: 9.5ppg and 8.0rpg in two games. He plays currently for the Senegalese U18 national team. #12. International point guard Xane d'Almeida (181-83, currently plays in France) helped Charleville-Mezieres win their game against the 14th-ranked GET Vosges 85-79 in the French NM1 (third division) in Saturday night's game. d'Almeida scored 11 points and added 9 assists. d'Almeida averaged so far 12.3ppg, 4.0rpg and 8.3apg. He is also in the roster of the Senegalese national team. #13. International guard Lamine Sambe (188-89, currently plays in France) helped Rueil win their game against the 14th-ranked CFBB crushing them 93-60 in the French NM1 (third division) last Saturday. Sambe scored 10 points, had 5 rebounds and dished 7 assists in 27 minutes. Sambe averaged so far 12.0ppg, 2.7rpg and 6.3apg in three games. He is also Senegalese national team player. #14. Former U18 international center Papa Mbaye (209-90, currently plays in Spain) helped Lleida Basquet win their game against the 14th-ranked Palma crushing them 86-66 in the Spanish LEB Gold (second division) in Friday night's game. Mbaye recorded 8 points in only 14 minutes. It was his first game for Lleida Basquet this season. Mbaye used to play for the Senegalese U18 national team back in 2008. #15. International center Maodo Nguirane (210-93, currently plays in France) helped Saint Vallier win their game against the 14th-ranked GET Vosges 82-68 in the French NM1 (third division) on Friday night. He recorded 5 points and grabbed 7 rebounds in 18 minutes. This year Nguirane's total stats are: 2.5ppg and 5.0rpg in two games. He used to play for the Senegalese national team last year. #1. Wally Niang (206-C-96, currently plays in Sweden) was the major contributor in Wetterbygden's victory against the closely-ranked Koping Stars (1-2) crushing them 95-55 in the Swedish Basketligan on Tuesday night. Niang had a double-double by scoring 22 points and getting 13 rebounds. He also added 3 blocks in 26 minutes. Wetterbygden Stars Huskvarna (2-2) is placed fifth in the Basketligan. But the season just started, so everything may happen. Niang has individually a very good year with high stats. He averages: 18.5ppg and 11.5rpg in four games he played so far. #2. Michel Diouf (208-C-89, currently plays in Basketball Champions League). Diouf could not help Bakken (3-1) to beat Spirou Charleroi (3-3). He recorded 7 points, 9 rebounds and 2 blocks. Bakken was defeated 74-69 at home by the lower-ranked Spirou Charleroi (#7). It was Bakken's first loss after three consecutive victories. The Qualifying Round already ended in the Basketball Champions League. It's Diouf's fourth season with the team. This year Diouf has relatively solid stats: 11.3ppg, 8.8rpg and 2.8bpg. #3. Sidy Djitte (208-C-94, college: Clemson, currently plays in ABA League) led his Montenegrin team Sutjeska to a victory against the ninth-ranked Lovcen (1-1) 81-71 in the Erste Liga last Wednesday. He scored 14 points, grabbed 9 rebounds and made 3 blocks in 24 minutes; quite an impressive performance considering it's only Djitte's second season in pro basketball. KK Sutjeska Niksic (1-1) is placed fourth in the Erste Liga. Djitte averaged so far 12.5ppg, 3.5rpg and 5.5apg in two games. #4. Mamadou Diagne (208-C-98, agency: BeoBasket, currently plays in Spain) led Barbera to a victory over the tenth-ranked Andorra II (1-2) 80-75 in the Spanish EBA (fourth division) in Saturday night's game. Diagne was the top player that evening. He had a double-double by scoring 22 points and getting 11 rebounds in 32 minutes. Barbera Team Values (1-1) is placed seventh in Group C-B. Diagne averaged so far 14.5ppg, 6.5rpg and 1.5apg in two games. #5. Mouhamed Barro (205-F-95, currently plays in Spain) was not able to help Gipuzkoa in their game against Baloncesto Fuenlabrada (1-1) in the Spanish Liga Endesa. He was the second best scorer with 9 points. But Gipuzkoa was badly defeated 76-60 on their home court in San Sebastian by the much higher-ranked Baloncesto Fuenlabrada (#8). This season Barro averages only 4.5ppg. #6. Ilimane Diop (210-C-95, currently plays in Spain) was not able to secure a victory for Baskonia in their game against Burgos in the Spanish Liga Endesa. He scored 7 points and grabbed 5 rebounds in only 11 minutes. His team was edged 82-79. This year Diop's overall stats are: 5.5ppg and 4.5rpg in two games. He has a dual citizenship: Senegalese and Spanish. #7. Mamadou Samb (210-C/F-89, currently plays in Spain) couldn't help Real Betis in their game against Magia Huesca in the Spanish LEB Gold (second division). He recorded only 4 points and grabbed 6 rebounds in 10 minutes. It was his first game for Real Betis this season. His team lost 84-92. Samb is another player who holds two passports: Senegalese and Spanish. #8. Khadim Sow (210-C-99, currently plays in France) contributed to an ASVEL Lyon-Villeurbanne Basket's victory against the closely-ranked Gravelines-Dunkerque 96-84 in the French ProA on Saturday night. He scored 8 points. Sow's overall stats this season are: 5.7ppg and 2.0rpg. #9. Mamadou Niang (209-C-94, currently plays in Spain) couldn't help CB Canarias in their game against Real Madrid in the Spanish Liga Endesa. He recorded 6 points in only 12 minutes. His team lost 73-88. This year Niang's overall stats are: 3.0ppg and 3.5rpg in two games. #10. Serigne Ndiaye (204-C-98, currently plays in Spain) couldn't help Quintanar (1-1) in their last game on Saturday. Despite his very good performance Quintanar (#8) was edged 64-62 on their home court in Quintanar by the higher-ranked Gran Canaria II (#3) in the Group B. Ndiaye was the second best scorer with 16 points. He also added 9 rebounds. This season Ndiaye has very high stats. He averages: 16.5ppg and 8.5rpg.